October 29th, 2007 : Sunny and Cold, Water Temperature 65* and Stained. Caught bait early and picked clients up at their dock at 7am. 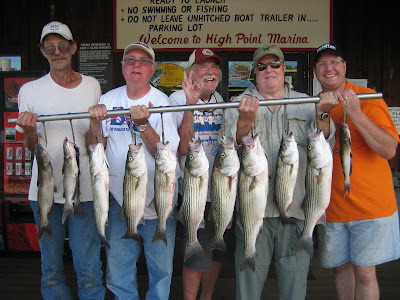 Set out planner boards and a bobber rigged with big Gizzards right in front of their dock. 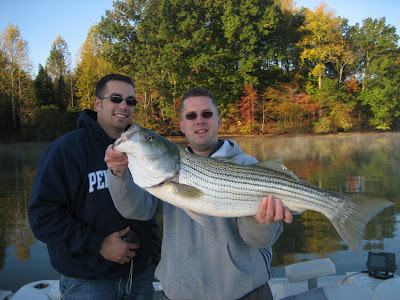 Hit a hump right across from their dock and Mike hooked up with the first Striper of the morning. Just as soon as he put his fish in the cooler another fish rolled a Gizz and then hit the next board that was in line. Ryan grabbed the rod [although still half asleep and hung over] and attempted to fight the fish. He acted like he hooked a freight train by the way he was fighting the fish and complaining how hard it was to turn the reel. He battled the fish to the boat and we relieved him by netting the fish. We continued to pull boards getting strikes on most points and humps which was surprising to me due to the fact that yesterday the coldest weather blew in from the north dropping the water temp 5 degrees and waking up to 30* air temperature with blue skies today. 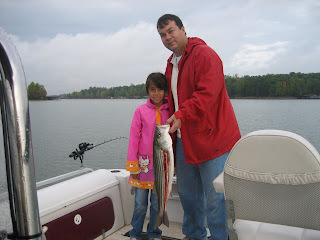 We ran out of bait and caught more then went downlake and hit another area . 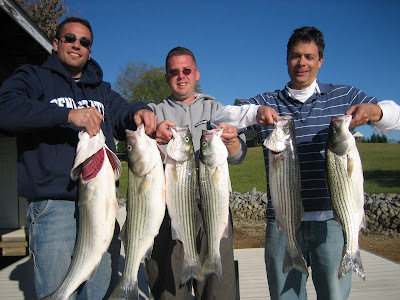 Before I got set up a Striper hit my bobber while I was still letting it out and the next flat we hit produced two Stripers with Nick catching one on a board and Ryan nailing one also. We had 17 strikes today, not bad for the conditions. October 18th, 2007 : Partly Sunny and Pleasant, Water Temperature 73* and Clear. Got out on the water early to catch bait, picked my clients up at 7am. Right off the bat found a school of fish blowing up on the edge of a flat but could not fish them due to other boaters also seeing the fish and crowding the area. Too many times when we are on fish and the fish show themselves inconsiderate fisherman run in and either cut our lines and always spook the schools. We simply left and set up on a school in 25 feet of water. Lost that school quickly and went and set up on a 20' flat and pulled boards and downlines but only got hit on the downlines. Went and caught bait and located a major school and we couldn't get the baits out quick enough for the Stripers would hook up and it took some time for Bubby to get the fish in. Greg would help me netting the fish and once we got all the lines out Greg participated in the fun. 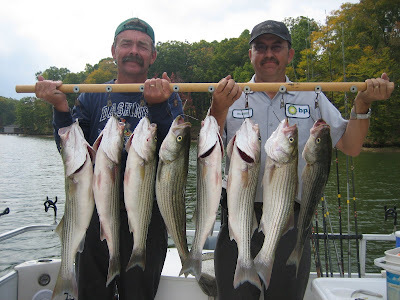 The fish hit both boards and downlines but we really nailed more fish on the downlines. Bubby caught the bass in the picture right up on the bank. 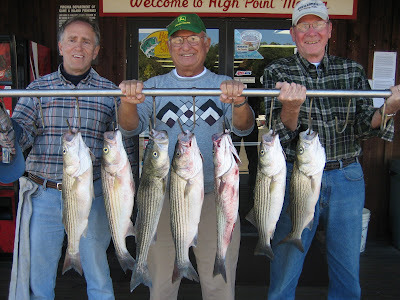 We returned a lot of nice keeper Stripers to the Lake to fight another day and the guys kept only 8 to take home for the freezer. Picked clients up at 6:45 and went and caught bait. Set up on 20' flats pulling boards and running downlines. Hooked up with a downline and a freeline at the same time then went a 1/2 mile without another hit. Worked a little shallower and hit another area in 16 feet of water where we had 8 hits but the fish were not wanting to eat the bait and only put one fish in the boat. Went and caught more bait and found a school of Stripers in 32' ,put downlines in their faces and caught only 1 before the school evaporated. Found another school, again putting downlines on them, catching a couple more. 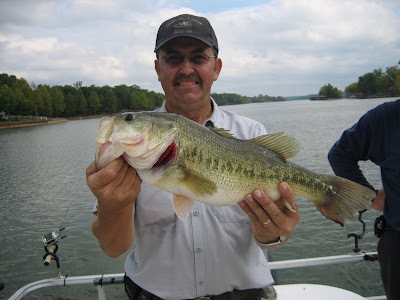 Fishing was slow today following a major cold front that blew through yesterday. I am surprised we caught what we did. Hopefully the lake will cool down enough to turn the fish on. October 4th, 2007 : Sunny and Pleasant, Water temp 78*. Got on the water early to catch bait and caught only 16 pieces and went to pick clients up at 7am. 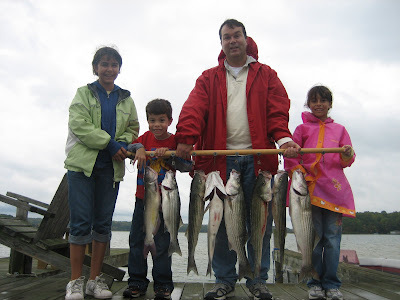 They showed up late so we went and caught enough bait to get started. Didn't get started fishing to almost 8:30 so we missed the early bite. Set up on 20' flats and pulled 9 planner boards, a bobber and 6 downlines and on the first 300 yard pull we caught a 28" Striper and had 4 more hits that just wouldn't hook up. I turned around and ran it again with no luck so we hit similar flats nearby with limited success. 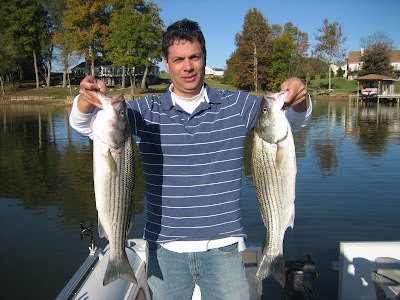 The fog finally broke around 11 and once the sun cam out the Stripers pulled off the flats to the ledges. We hit one school with 10 of our lines going off and tangling up the other 5. We retied and turned around but they had moved on. We located them again and worked on them some more. 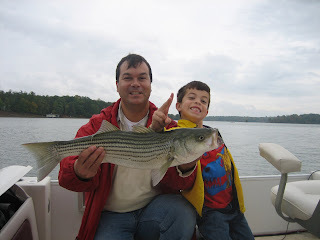 Today we had 38 strikes , boating 8 Stripers and a couple of Cats. We lost a half dozen at the boat.